I remember this question being posed to me, seemingly ill-fitting during the course of a job interview. Sure, I’d brought it up – I thought it was important to mention these two labels when talking about the intersectionality of my identity, and how it could be an asset to their media company. I was a young, Muslim feminist, wanting to work for an outlet that catered to women and issues pertaining to them. I felt my demographic would help explain my interest in working there, and my excitement for the stories I would hope to write with them. But then I got asked this question and suddenly, I was reminded that for many people, Muslim women aren’t included in the conversation when it comes to feminism. This notion often stems from the perception that Muslim women are oppressed, dominated, and bound by the laws set by the patriarchs of their family. That we cover without choice because – ‘Well, why would someone want to dress like that?’ I’ve had women stop me on the street to say “Honey, you don’t have to do that for your husband,” while vaguely gesturing towards my Islamic attire. And others who’ve asked if someone “made me do it,” half expecting that I’d blink twice and signal the need for my rescue. These moments made me question if I and my veil were included when it came to talking about feminism. And as it turned out, I wasn’t alone when it came to these concerns. The word feminism, loosely defined as having equality amongst the sexes, has held different meaning depending on who’s asked. The definition of which, we hope, will continue to evolve over time, becoming more inclusive of narratives from communities that aren’t cis, white, and able-bodied. Feminists Don’t Wear Pink (and Other Lies) by Scarlett Curtis is a collection of stories where women from different backgrounds reflect on the F-word and what it means to them. From young activists to notable actresses, it shows how feminism is a word that many women are still grappling with, trying to figure out whether or not they fit the infamous label. And while this book does a great job of getting a diverse range of responses, I wanted to know how the rest of the MG staff felt about the F-word and whether or not they ascribed to it. “What does feminism mean to me? For me, feminism boils down to the very basic concept that a woman has the right to choose the way she moves through her life (gasppp, groundbreaking). Feminism means every young woman has the right to her own agency, irrespective of her socioeconomic and cultural barriers. Breaking out the History Books. In Need of a Reboot. 1400 years ago Islam liberated you. Sisters, don’t play into dissension. until it’s an inconvenient truth. gain that ajr in the akhirah. Your rights are waiting, culture permitting. 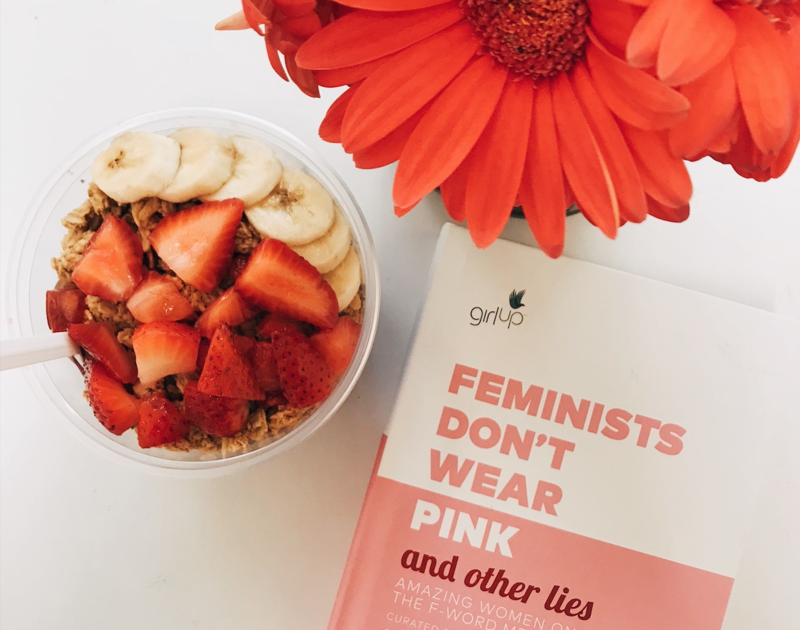 In reading the responses, it’s clear that, like the women in Feminists Don’t Wear Pink, each of our writers has a different relationship with the word feminism. Some are concerned that it’s grounded in exclusivity, leaving little room for women like us, while others argue that that’s a trope of the past, and that the movement is much more welcoming now. And though that may be difficult to believe, if we continue to respect one another’s agency, root for each other’s happiness, and help create opportunities for all women to thrive, we might be able to get that much closer to equity.